Oh no! This yellow guy jumped out of the Spathiphyllum as I was watering! It’s a bright and kind of cool-looking insect, although I was scared of them when I was a little girl. 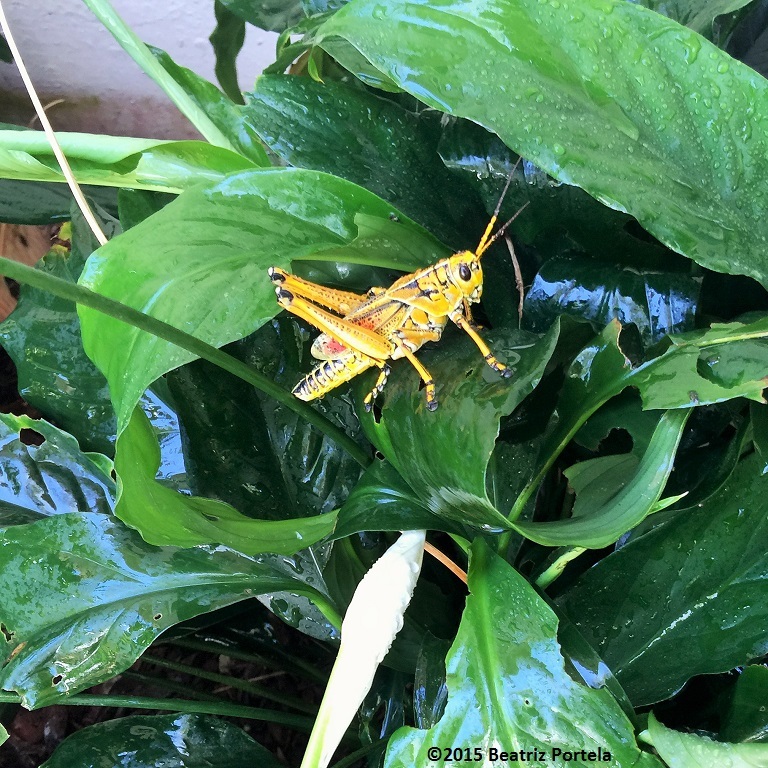 Unfortunately grasshoppers are big plant eaters and can annihilate a garden, especially if they start reproducing in your yard. As you can see in the picture, this one is eating the leaves of the Spathiphyllum, which is one of the decorative plants in a shady area of my yard. Grasshoppers are a food source for reptiles, insects, small mammals and birds. They are also eaten by humans in Asia and Africa. I’ve seen fried grasshopper for sale in Vietnam. No, I haven’t tried one; I’d rather eat plants, too. Perhaps one of the birds or large lizards in my yard will go for raw grasshopper. Just in case they don’t get it before it goes into reproduction mode or moves over to one of my edible plants, I called the grasshopper police (i.e. my feet) to stomp it out! © 2015 Beatriz Portela and gardeningB.com. Excerpts and links may be used and are encouraged, provided that full and clear credit is given to Beatriz Portela and gardeningB.com with appropriate and specific direction to the original content. Any other use and/or duplication of this written material & picture(s) is prohibited without written permission from Beatriz Portela. Always learn something on your site. Today it is that there are poisonous grasshoppers. Great post. Thank you. This one is poisonous and nothing will eat it. It could probably survive a zombie invasion. It is from Cuba and is a grasshopper out of place-an invasive. Then it’s a good thing the grasshopper police got it! He looks huge! I used to chase and catch grasshoppers when i was a kid, except for the really big ones or the ones that appeared to be covered in some kind of dusty coating. Loved you description of the ‘yellow guy’ being stomped by the feet police. Sometimes you have to do what is needed.